Last Thursday, a man viciously shot and killed nine people at Umpqua Community College in Oregon, injuring several others. Nine of the victims were Christians, who the gunman singled out to murder. This incident has sparked an important question–what does it mean to be a Christian? A lot of times when we close our eyes and think of a Christian, we envision a person with a Bible in his/her arms, going to church and singing songs of joy. On the other hand, some people see Christians as old-fashioned, close-minded individuals who spend their free time judging the actions of others. Both of these examples are stereotypes—it’s not that they can’t ever be true—but for the most part this is not what the average Christian looks like on a day to day basis. A Christian is a follower of Jesus. A Christian is a person who decides to believe in God and His only Son Jesus. It is a person who fully surrenders his or her life to God. A Christian can be anyone: black or white, male or female, educated or illiterate, wealthy or poor—and anyone in between. There is neither Jew nor Greek, there is neither bond nor free, there is neither male nor female: for ye are all one in Christ Jesus (Galatians 3:28 KJV). There is no one who God will turn away. All you have to do is believe and acknowledge Him. But whosoever shall deny me before men, him will I also deny before my Father which is in heaven (Matthew 10:33). Yes, there are some people who do bad things and call themselves Christians. These people are either liars, in need of repentance, or are not fully surrendered to God. Sometimes people just make mistakes and need help. Obviously we are not perfect; this is why we need a Savior. Here’s the thing I want all believers or those who want to find out more about Jesus to know: Life with God isn’t a fairy tale. All of life’s troubles and struggles still exist after you are saved. In fact, sometimes life can actually get worse when you become a Christian. As soon as the devil knows you’re getting close to God, he tries to wage a war against you. Some of you may ask, what’s the point of becoming a Christian if I don’t get anything out of it? Well, you do get eternal life, God’s Holy Spirit, and the fruits of the Spirit (Galatians 5:22-23), but being a Christian is not about making our lives awesome. In fact, it isn’t about us at all. God’s sole purpose is not to give us everything we want in life. On the contrary, God wants our lives to be about Him. He wants us to love and serve Him with abandon. He wants us to give our all just like Jesus did for us. In return for this, we can be called His children (Galatians 3:26). The victims of last week’s shootings are God’s children. They are His good and faithful servants. They did something so courageous, that even I don’t want to imagine it. They truly gave up their lives for Jesus, and they will be rewarded for it in heaven. These are the names of some very courageous heroes. Please remember to pray for their families and loved ones. And remember that being a Christian means more than just trying to be loving and good. 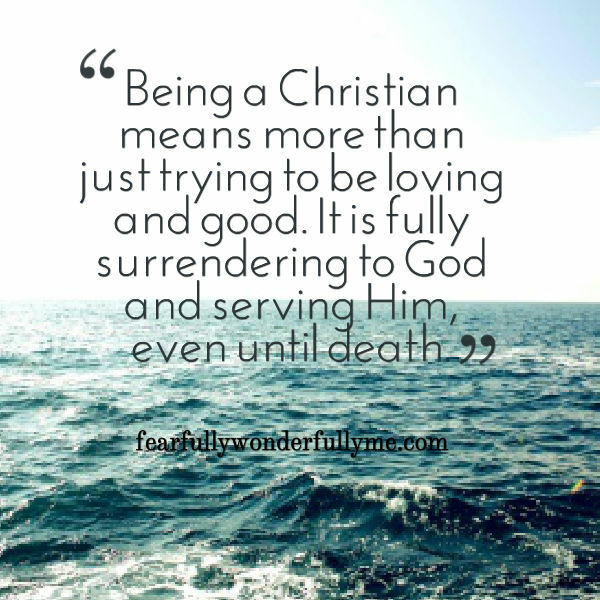 It is fully surrendering to God and serving Him, even until death. We must be ready to be bold and brave, no matter what we do. My hope and prayer is that this senseless violence will end, but I know that the world is growing more evil every day. Although life as a Christian may not always be easy, it is so worth it. Even my best days without knowing God can’t compare to my bad days with Him. He is the lover of my soul. My Savior, King, Father, and Friend. Come Lord Jesus! Let us preach the Gospel so more people can know their Savior. Let us live boldly and without fear, because God is on our side!